When the summer is drawning slowly to an end, some of the year’s best fishing is closing in upon us. Personally I prefer this time of year over anything else, except spring. Fall and spring fishing conditions are kinda similar, only different techniques are used. Probably the main different is lure size. Having fished with 4 to 6 inch lures all summer, it’s now time to gear up. Pull out your big cranks. Pike and Muskie are on the hunt for food right now. They need to build up fat for the coming winter to develop their eggs, and what better way to do so hunting for big baits. In late summer we slowy start switching lure sizes from 6 to 8 inch in length. Lure’s that run less than 12ft are excellent for this. The fish have stayed in the deep springholes during summer, and now start to move back in. Whilst in July you had to go down deep to get the big ones, they now come up for your lure with ease. When the water starts to cool, they feel more at home in the shallows, where all the newly born baitfish are located. Early in the morning, or late in the evening you can see schools of baitfish tracking round the shallows. Often followed by Perch, it’s not uncommon to hear splashes on the water from feeding fish. Fish jumping around, you know something bigger might be there. Trowing 7” Shallow Raiders, or 6” Jake’s and Grandma’s can be extremely effective now, not to mention spinners, spinnerbaits or jerkbaits! Caught in the act, this 42 incher couldn’t resist a shallow raider! During the day, it can be quite busy on some waters. I’d like to fish on rivers and lakes. Fish in these waters are familiar with boats, even though they stay at sharp dropoff’s during the daytime period. In this time of the year, the sun is not as bright anymore as it used to be in summer. The sky is often filled with large heavy clouds, and you can see the most beautiful appearence occur in the sky above you. One of my favourite fishing spot’s in this period are sharp edges in the water. Now we all know that Pike like these kind of circumstances. They are the perfect ambush predator when the sun is up during the day. That’s when you need to reach out for these bigger baits! You can use all types of lure’s for these kind of fishing, but I prefer a 8” Jake, 9” Grandma, or a 9” Shallow Raider over anything else! Their action is just perfect. A slowly wobbling action from side to side, mimicking a dying or wounded baitfish perfectly! Crankbaits of these type are called flankers, because they ”flank” from side to side. Don’t be afraid to put one on! When it comes to colour choises I always go for the ones that stand out in the water colomn and have the best contrast! As described earlier in the article ” Colours for Esox” in the Techniques section of this site, it’s all about contrast. The key is to find the right kind of speed that is both suitable for your rod and the fish. Bear in mind that trolling these crankbaits can be quite hard if you don’t have the right material in your hands. If you take a closer look at the lip of these lures you can see that they are installed in quite a steep angle. Trolling 2 to 3 mph can feel like you are taking part in a weight lifting challenge. Make sure that the rod you are using is at least 8 or 9 ft in length! And preferably has a medium to heavy fast action. You will understand what I mean by that once your’e on the water, trust me! 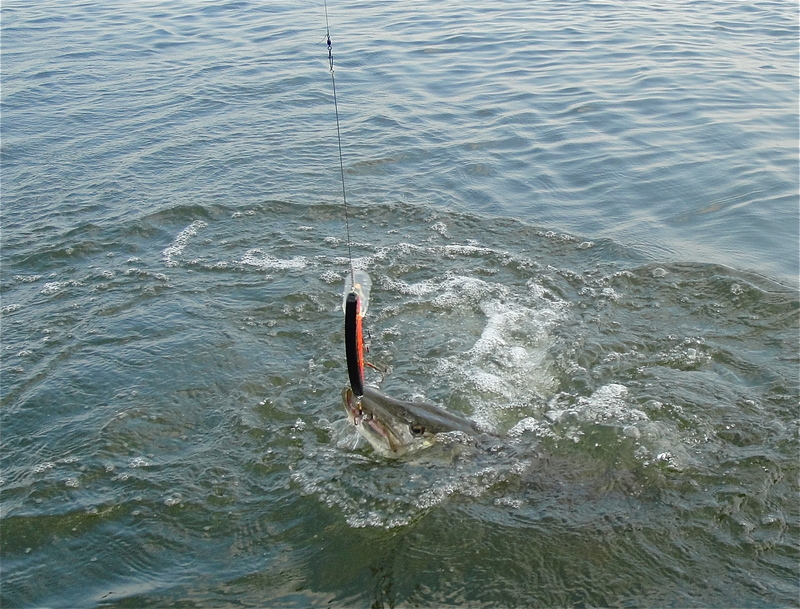 Secondly, the bites on these lures can be ferocius, so make sure you got enough power in your rod to set the hook. Later in the afternoon, fish are starting to move back in again. Back in summer, when the vegetation was up in the water surface, the density of the weed was high. Now the under water leaves start to decay and due to bird and recreational circumstances, you will find large gaps in the weed. Remember I mentioned earlier that Pike are ambush predators? So where they are now? Right on the edges of the weeds! Waiting patiently for anything to pass by their mouth. On some waters the vegetation is now round about 19 to 25 inch below the surface. There aint much room for for any lures, because below the weed is still quite dense. But don’t worry, there are many possibilities to score big in this occasion. Pike are the coolest of the cool, and however people claim that when the water starts to cool, they also slow down. In my eyes that ain’t true! While in summer temperature can be in the high 70’s, the water in this period is mostly around the 60’s. As they are absolutely not a fan of warm water, they can become very active when the water cools down. Especially in the shallows where they can approach their prey quickly and don’t have to swim round much for a prey than when the water is deeper. Most of the time are lure in sight, means a fish in the net. You want to focus on these weed pockets and use a lure that get’s within sight easily! 9” Suick’s, ERC Grinders, Double 88’s or shallow running swimbaits like the Sure Thing do the job. And when you find a good one, you can run into a big reward! Fooled by a Double 88 EsoxOnly spinner, 47” late summer beauty!